The election is in full swing and I struggle to find time to write, but I’m going to try to post a bit more often. The most common sentiment I run into during this campaign, one that I tended to fall victim to myself (to a lesser degree), is the idea that Hillary Clinton is corrupt and that she’s dishonest. I ran into the meme to the right earlier today. We don’t know what Trump will do for sure. But we know what Hillary will do for sure, right? I know that she’ll be a capable President who won’t fly off the handle at every insult from a foreign leader. I know she’s had plenty of experience in dealing with domestic and foreign affairs and shown herself to be capable in both arenas, even if she is more hawkish than I’d like her to be. Do you realize that the allegations of corruption are only allegations that it only might look like there was impropriety? For example, she took a lot of crap recently about Clinton Foundation donors getting special access to her as Secretary of State, but did you actually look at those emails? The donors requested special favors… BUT GOT DENIED. They’d ask for a special diplomatic passport and they wouldn’t get it. They’d ask for a meeting and they’d get denied and told that if they wanted the meeting they had to go through official channels. She acted exactly as you’d want her to in those situations. Let’s also not forget they were donors to the Foundation that doesn’t benefit her monetarily. Those donations go to their charitable actions and the Clintons don’t draw any kind of salary from the Foundation. There can’t be any Pay For Play scenario because they were no pay involved. However, when you look at Trump, he literally has been using his Foundation to buy things for himself. And used donations to bribe the Florida AG so she wouldn’t sue him for his fraudulent Trump U. Don’t those things bother you at all? 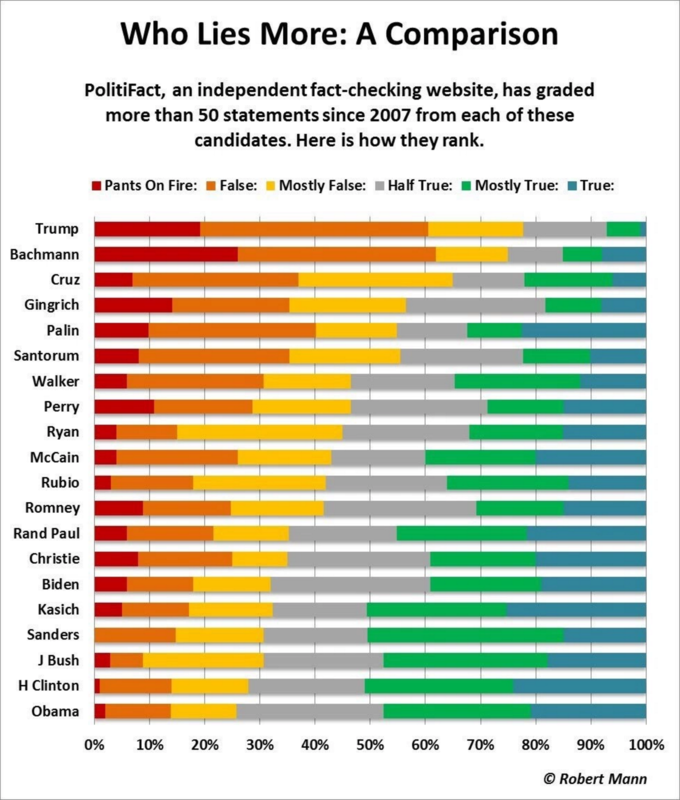 The chart of ratings from Politifact (above) shows that not only is Hillary very honest, she’s one of the most honest politicians involved in this entire election… and guess who is the biggest liar? Do you honestly not see that Trump lies essentially every single day? The media has had to change the way they report on things because he lies so often and so blatantly. They have to keep fact-checking him in the chyron at the bottom of the screen. According to Politifact, 1 out of 5 things Trump says classifies as Pants of Fire because they are SO dishonest and blatant. If you include Mostly False, False, and Pants on Fire you get an astonishingly high 77% of the things he says are lies. Conversely, Hillary Clinton only gets 28% on that front. So, really… isn’t he the one you should accuse of being a liar? With regards to the email server, the FBI clearly stated that she did not break the law. She was careless and shouldn’t have done the stuff with the email server (and I agree with that), but they clearly say she didn’t break the law. Here is Director Comey stating that unequivocally. However, Trump has nearly constantly been taken to court AND LOST because he is constantly breaking the law and screwing people over. He refuses to pay them for their work or uses racial profiling of tenants, etc. The New York AG has even opened an inquiry to look into Trump’s fraudulent and self-dealing actions with his Foundation! Seriously, I know that Clinton has her problems, but she gets accused of a lot more than she actually does, and even if you include all of those things she’s falsely accused of when you look at Trump he actually does have those problems and 10x worse. The choice between Hillary Clinton and Donald Trump is not a choice. Trump is dangerous, thin-skinned, con-artist who only wants power for himself and will lie, cheat, and steal to get it.